This beautiful medieval town, with its delightful narrow alleyways and streets, superb views of the Umbrian countryside and fountain-splashed piazzas, is undoubtedly one of Italy’s finest architectural masterpieces. Assisi has drawn people in search of culture and romance for centuries – few towns in Italy can compete with its Classical origins, historical significance, and scenery. The town buzzes with visitors in the summer, who come not only to enjoy the museums, churches, and monument but also the fantastic local cuisine and Umbrian wine. Moreover, Assisi’s best sights are encompassed within such a compact area, that the town seems to reveal its treasures at every step. Assisi’s history stretches back to pre-Roman times and a thriving settlement existing in what we now know as Assisi long before the Roman’s consolidated their hold over Italy. Historians trace Assisi’s origins back to around 800BC, traveling nomads, the Umbri started to build fortified settlements along the River Tiber in central Italy, including the area that today houses the town of Assisi. The Umbri prospered based on agriculture and fishing in the river Tiber, but eventually, the settlements were occupied by the Etruscans, whose civilization co-existed with the Umbri but ultimately exercised control over the region. The Etruscans controlled this area of central Italy for over a century, but conflict with the emerging Roman civilization came to a head in the Battle of Sentinum in 295BC. The combined might of the Etruscans, Umbrians and Samnites could not defeat the Roman army and the settlement became a Roman Municipium or district under the name of Asisium. Asisium remained under the jurisdiction of the Roman Empire for several centuries, during which time, Umbria became an important territory in the Empire. Its inhabitants were one of the first to convert to Christianity, the incumbent Bishop Rufinus evangelized the citizens of Asisium in 238 A.D. However, the Germanic Goth tribes arrived in the 5th century and the Roman’s control over Western Europe eventually collapsed. The settlement was captured by the Ostrogoth King Totila in 545; it then became part of the Lombardy Kingdom and subsequently the Frankish Duchy of Spoleto. The settlement grew and prospered under the rule of the Duchy of Spoleto, and Assisi enjoyed a stable and peaceful existence until the 12th century. In the late 11th century the town became an independent, so-called Ghibelline commune or semi-autonomous city-state. The term Ghibelline refers to an order that supported the Holy Roman Emperor, as opposed to the Guelphs who had sworn allegiance to the Pope as supreme head of the Church. The neighboring Umbrian town of Perugia was a Guelph commune, which caused considerable tension between the two communes. The conflict finally erupted in 1198 when the inhabitants of Assisi marched against Perugia and were beaten in a battle at Ponte San Giovanni. Among the prisoners taken by the inhabitants of Perugia was a certain 22-year-old Giovanni di Bernardone, who today is known as St. Francis of Assisi. Undoubtedly the town’s most famous resident, Giovanni Francesco di Bernardone was born in the winter of 1181, the child of a wealthy tradesman, whose family came from Tuscany. After his spell in captivity in Perugia, legend claims that Francesco decided to fight a crusade of the Count Walter de Brienne to reclaim the city of Athens. Illness, however, struck Francesco and he was forced to renounce his chance of glory and contemplate his future. He chose to abandon a life of wealth and ease and founded the order of the Grey-Friars. Today, his legacy survives and St. Francis is remembered for his humility, obedience to the Church and love of nature. After the death of St. Francis in 1226, he was proclaimed a Saint only two years later by Pope Gregory IX, who began the construction of a church in his honor. The 13th century would also see Assisi expand beyond the confines of its medieval town-walls, incorporating the convent and Church of St. Francis. The population continued to grow until the Black Death struck in 1348, which reduced the town’s population significantly. Assisi’s fortunes sadly went from bad to worse, as the town became embroiled in a conflict that would endure for more than 150 years between the two major Assisi families, the Nepis (of the upper town or Parte de Sopra) and the Fiumi (of the lower town/Parte de Sotto). From the 14th century until the end of the 16th century, they fought each other bitterly for control of Assisi. However, the beginning of the 17th century would herald better times for Assisi and the post-Renaissance centuries were largely peaceful. Many important landmarks were constructed during this time, including the wondrous Basilica of Santa Maria degli Angeli and the Palazzo di Bernabei. As the town increasingly became an important destination for Christian pilgrims far and wide, so did the general renown of Assisi through Europe. The town enjoyed a stable and prosperous existence until the outbreak of the First World War in 1914. Assisi escaped reasonably unscathed from the conflict, although many Italians lost their lives in the campaign against the Austro-Hungarian Empire. History repeated itself after the outbreak of World War II, in 1939 and Italy suffered many disastrous defeats from the Allied forces over the course of the war. However, Assisi itself was again largely unaffected by the fighting and the town will be remembered for the heroic acts of Father Rufino Niccacci, who sheltered 300 Jews during the War and gave them new identities and lives. Assisi emerged from the horrors of the Second World War with a new government and a renewed sense of optimism. Northern and central Italy modernized at a rapid rate over the second half of the 20th century and towns like Asssi continued to prosper from Italy’s appeal as a major tourist destination for culture loves. A series of devastating earthquakes hit the Umbrian region in September 1997, although thanks to the efforts of the local authorities, Assisi’s major historical sites were repaired and reopened within two years. Today, this captivating, picturesque and inviting town remains a “must see” for travelers to Italy. It is a living history lesson, a testament to the bravery and passion of individuals like St. Francis and Father Rufino. It delights the senses with its architectural splendor and of course, its citizen’s affinity with the best things in life, namely only the freshest food and the finest wine, shared with family and friends. Simply put, few towns in Italy are more magical than Assisi! Italians are very (understandably) proud and passionate about their ingredients and food. Almost every town and village has its own dishes and each region has its own distinctive cuisine, making use of locally grown seasonal ingredients. To Italians, food is life, not just something that keeps you alive. Good cooking is in their blood and the Umbrians are no exception. Assisi, like every Italian town, has its abundance of good dining options – cafes, pizzerias, trattorias (informal bistro like venues) and ristorantes. The oldest part of Assisi is full of good, and good value trattorias, where visitors can sit on a sun-kissed terrace, sipping local wine while perusing some of the local cuisine on the menu. All year round, but especially in the spring and summer months, Assisi has superb produce markets to explore, selling first-class local delicacies including cheese, bread, wine, olives, and meat. 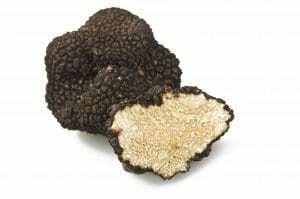 Umbrian specialties include; black truffles, game in the winter months and fantastic olive oil. Porchetta is a definite seasonal highlight – young roasted suckling pig stuffed with fennel and garlic. Of course, national favorites such as classic pasta dishes, pizzas and desserts are available all year round. The region is renowned for its white wine Orvieto, a blend of Trebbiano and local varieties Grechetto and Drupeggio. Torgiano is the area’s best appellation for red wine, elegant and long-lived wines are produced from Sangiovese which is sometimes blended with cabernet sauvignon and other international varieties for color and body. Considering the quality of what is available, prices are very reasonable and there is no excuse for not stocking up on excellent local wines to enjoy at home! Construction of this fascinating and beautiful church started in 1228, two years after the death of St. Francis of Assisi. Over the next century, it’s Upper and Lower Churches were decorated by the foremost artists of their day, including Pietro Lorenzetti and Giotto, whose frescoes are some of the most stunningly beautiful in Italy. Highlights include the crypt, which contains the tomb of St. Francis and the Capella di San Martino, exquisite frescoes by the artist Simone Martini. 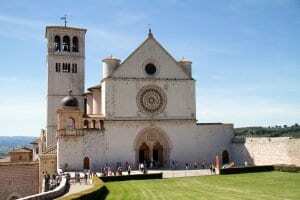 The Basilica, which dominates Assisi, is one of the great Christian shrines of Italy and receives large numbers of visitors throughout the year. Best to visit with a private guide. Assisi’s most important reminder of its Roman history, the Roman Temple-front dominates the Piazza del Comune, the town’s main square. The Temple dates back to the Augustan age and it was converted into a Christian Church – Santa Maria Sopra Minerva – after the town was canonized by Bishop Rufino in 238AD – Its beautiful interior is well worth a look. This cutting edge and welcoming property, situated in the Umbrian town of Orvieto has been at the forefront of the Umbrian wine revolution. Decugnano is not afraid to experiment with new varieties and wine style and produce an excellent range of reds, whites and even sparkling wine. Their Maris Chardonnay is already legendary and the reds are smooth, cherry scented delights. They love to welcome our visitors and will tempt you with a mouth-watering selection of wine and olive oils.